We are a leading Distributor / Channel Partner of jabra biz 2300 duo headset, jabra biz 2400 ii qd duo headset, jabra speak 410 ms conference speakerphone oc uc, jabra speak 510 ms conference speakerphone oc uc, jabra speak 510 plus ms conference speakerphone oc uc and jabra speak 710 ms conference speakerphone oc uc from Delhi, India. The Jabra GN1900USB monaural corded headset is a smart choice for Skype, softphone, or other PC-based IP Telephony users who spend a lot of time on the phone. The Monaural design allows you to keep an ear on what is happening in your environment while the Jabra speaker allows you to hear your caller clearly and easily. The Jabra BIZ 1900 Mono USB delivers professional performance and exceptional value. It is the cost-effective headset investment decision that doesn't compromise on quality. 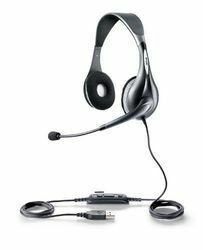 Designed for contact center use, the Jabra BIZ 1900 Mono USB mono corded headset increases agent productivity and performance. 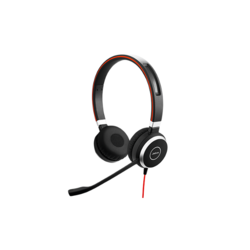 Its noise canceling microphone ensures that background noise from your work environment will not be transmitted to your customers' ears.The headset comes complete with USB plug for instant PC connectivity. Simply connect the headset to the computer and you're ready to profit from the Jabra BIZ 1900 Mono USB's low cost of ownership. Its multiple adjustment points make it truly adaptable to individual preferences. Its headband wearing style combined with a lightweight design ensures all-day comfort - even in very call-intensive environments. The Jabra BIZ 2400 II QD Duo NC headset surrounds your head in total comfort. Padding on the headband and dual stereo speakers completely cushion your head. The headset is also lighter than most other comparable solutions. Both the Kevlar-reinforced cord and 360-degree rotating microphone boom are extremely durable, resistant to forces that would damage other headsets. Rely on this headset as an all-day solution, able to keep going for years to come. PeakStop technology removes harmful audio spikes from the speakers, and the Air Shock microphone is aerodynamically designed to reduce popping noises from breathing or jets. Noise cancellation further enables the Jabra BIZ 2400 II Duo headset to take on demanding work environments where other agents and coworkers are constantly busy or on the phone. Use Application Web UC Client,Avaya,Cisco,Mitel,Unify,Alcatel-Lucent,Citrix & Microsoft (Skype for Business). The Jabra SPEAK 410 MS/UC is a portable USB conference phone that has been optimized for use with Microsoft Lync. 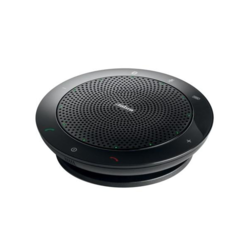 With a 360 degree Omnidirectional microphone, the SPEAK 410 is ideal for conference calls with 4+ participants. 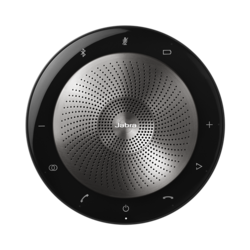 The Jabra SPEAK 410 has been designed for office professionals with everyday need for audio conferencing. The compact design and travel case make it easy to carry around, and the integrated cable management ensures quick set-up. It's the perfect solution for spontaneous conferencing and collaboration. Thanks to its advanced Digital Signal Processing, the Jabra SPEAK 410 MS provides crystal-clear audio with true wideband sound quality. 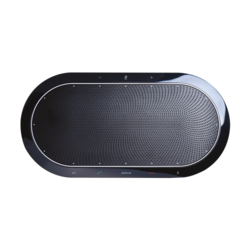 The powerful speaker and built-in Omnidirectional microphone offer a 360-degree coverage allowing conference participants to hear and be heard. Thanks to a 3.5 mm headset port and full-duplex audio, the Jabra SPEAK 410 MS is ideal for one-to-one conversations and other functions such as e-learning and listening to media playback from the computer. You can switch easily to private-call mode to not disturb your colleagues in open office environments. Use Application Web Avaya,Cisco,Mitel,Unify,Alcatel-Lucent,Citrix & Microsoft (Skype for Business). working Laptop,smartphone,or tablet via USB or Bluetooth. The Jabra SPEAK 510 is a portable conference speakerphone that can turn anywhere into a conference room. The SPEAK 510 has Hifi/wideband, an omni directional mic, and Bluetooth and USB connectivity for use with a PC, smartphone, or tablet. The Jabra SPEAK 510 allows you to take or make conference calls anywhere you are. The Speak 510 features 360 degree all around coverage so all present participants can hear and be heard. This personal desktop speakerphone also acts as an external speaker for PCs, smartphones or tablets. Connectivity Type Laptop,smartphone,or tablet via USB or Bluetooth. The Jabra SPEAK 510+ MS/UC is a portable conference speakerphone optimized for Microsoft and USB Bluetooth adapter that can turn anywhere into a conference room. The SPEAK 510 1`MS has Hifi/wideband, an omni directional mic, and Bluetooth and USB connectivity for use with a PC, smartphone, or tablet. The Jabra SPEAK 510+ MS/UC includes the SPEAK 510+ and Jabra Link 360 USB Bluetooth Adapter to turn any device with a USB port into a Bluetooth device. This allows you to take or make conference calls anywhere you are. The Speak 510+ MS features 360 degree all around coverage so all present participants can hear and be heard. This personal desktop speakerphone also acts as an external speaker for PCs, smartphones or tablets. This dual connectivity USB/Bluetooth speakerphone has up to 15 hours of talk time if charged, or if the USB is plugged into a device, the Speak 510+ has unlimited talk time. The Jabra SPEAK 510 is certified with Microsoft devices. Usage/Application Web Avaya,Cisco,Mitel,Unify,Alcatel-Lucent,Citrix & Microsoft (Skype for Business). Jabra SPEAK 710 MS/UC Speakerphone lets you enjoy high-quality sound in a premium "take me anywhere" design. Answer your calls or listen to music, whatever you do, you'll do with great quality. The Speak 710 features an Omni-directional microphone that can accommodate up to 6 attendees in a room with superb sound performance. Usage/Application Web UC Client,Avaya,Cisco,Mitel,Unify,Alcatel-Lucent,Citrix & Microsoft (Skype for Business). The Jabra SPEAK 810 MS/UC Speakerphone makes conference calling simple, and also allows for easy collaboration. With a slim, compact design, you receive the perfect solution for audio conferencing with an integrated USB Cable for quick set up. The SPEAK 810 has been fully labeled as a plug-and-play solution which can be connected either by cable or via Bluetooth® technology. Simply connect the device to your PC, tablet, or smartphone for instant communicative ease. The Jabra SPEAK 810 also incorporates excellent sound, providing a natural call feel with no feedback or echo - allowing for conversations to be kept flowing easily. 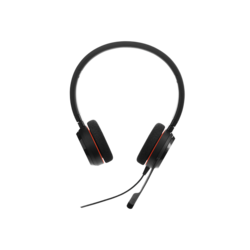 ninja by jabra is a professional entry-level headset that offersall of the essential jabra headset features. Noise cancellation the noise-cancelling microphone eliminates any background noise, ensuring that your conversation will always be heard. Bendable boom armthe boom arm seamlessly integrates into the headband toensure that it is customized for your comfort. Simply move theboom arm upwards when not on a call. Lightweight, robust designlight weight and robust, ninja by jabra is made to be worn allday. With an adjustable headband and microphone boom arm,you can find your perfect fit. Acoustic protectionninja by jabra integrates peakstop™ technology to protectfrom audio spikes. The Jabra EVOLVE 20 UC Stereo is a corded stereo headset for VoIP softphones. The Jabra EVOLVE 20 UC Stereo has noise cancelling technology, noise reduction ear cushions and a busy indicator light that makes this headset perfect for office use. Thisbinaural corded headsethas a premium sound experience with comfortable foam ear cushions for all day wearing comfort. 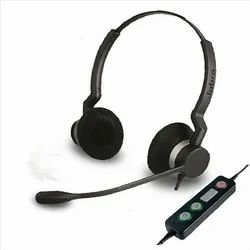 The adjustable microphone boom makes this a convertible headset for work calls or as a headset for listening to music. The Jabra EVOLVE 20 UC Stereo headset offers a mute function feature for its users. The headset is connected by USB which easily enables easy integration with any PC. The Jabra EVOLVE 40 UC Stereo is a Lync optimized corded stereo headset for VoIP softphones, mobile phones and tablets. The Jabra EVOLVE 40 MS Stereo has noise cancelling technology, noise reduction ear cushions and a busy indicator light that makes this headset perfect for office use. Thisbinaural corded headsethas a premium sound experience with comfortable leatherette ear cushions for all day wearing comfort. 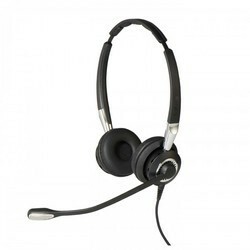 The adjustable microphone boom makes this a convertible headset for work calls or as a headset for listening to music. The Jabra EVOLVE 40 MS Stereo headset offers a mute function feature for its users. The headset is also adaptable with USB using its 3.5mm jack to easily connect to your PC, Smartphone or tablet. 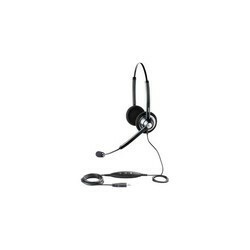 TheJabra UC Voice 150 Duois part of the Jabra Voice series of USB corded headsets. This stereo plug play USB headset can be used with all leading Unified Communications platforms and the latest generation of softphones. The Jabra UC Voice 150 Duo is a stereocorded headsetdesigned specifically for Unified Communication deployments. It has been certified and optimized with all leading Unified Communications platforms and is fully functional with the latest generation of softphones. The Jabra UC Voice 150 features superior sound clarity for softphone calls, conference calls, live presentations and other multimedia applications. This makes it perfect for light use by office professionals in both small and large office environments. The noise-cancelling microphone ensures that the recipient cannot hear background noise from the speaker's surroundings. The stereo design of the Voice 150 Duo makes it suitable for use in louder office environments. The Jabra Voice 150 headset is a cost-effective solution featuring Jabra's well-known high standards for sound quality, ease of use, and plug play compatibility. Simply connect the Voice 150 to the computer and it is ready for use. The intuitive call-control unit attached to the cord allows for fast user adoption. The Jabra UC Voice 550 MS Duo is part of the Jabra Voice series of USB headsets. This stereo plug play USB headset has been optimized for seamless integration with Microsoft Lync and Microsoft Office Communicator. The Jabra UC Voice 550 Duo is a stereo corded headset that has been optimized for seamless integration with Microsoft Lync and Microsoft Office Communicator. The Jabra Voice 550 is made for light-to-medium use by desk-centric professionals who occasionally work from outside the office and need to take the headset with them. It also appeals to users favoring the classic leatherette design. The Jabra UC Voice 550 features superior sound clarity for softphone calls, conference calls, live presentations and other multimedia applications. This makes it perfect for light use by office professionals in both small and large office environments. The noise-cancelling microphone ensures that the recipient cannot hear background noise from the speaker's surroundings. The stereo design of the Voice 550 makes it suitable for use in louder office environments. The Jabra Voice 550corded duo headsetis a cost-effective solution featuring Jabra's well-known high standards for sound quality, ease of use, and plug play compatibility. Simply connect the Voice 550 to the computer and it is ready for use. The intuitive call-control unit attached to the cord allows for fast user adoption. For PC-based IP telephony the Jabra GN2000 USB Duo Corded Headset supports the full IP network bandwidth for applications such as speech recognition, voice-over-IP calling and computer-based training. For traditional telephony, the Jabra GN2000 Series is the ideal headset for busy and noisy environments, utilizing the full frequency of the telephone network to ensure exceptional sound quality on every call. The Jabra BIZ 2400 II DQ Duo NC WB corded Headset contains high quality, full wideband HD audio for superior sound, improved noise canceling capabilities , and a break-proof FreeSpin boom mic with 360-degree rotation. The Jabra BIZ 2400 II DQ Duo NC WBis a part of the Jabra 2400 series and is a two-ear, noise canceling headset that caters to a full wideband audio requirement. The Jabra BIZ 2400 II DQ Duo NC WB is designed to ensure maximum service life and minimum maintenance costs. Some of the key details lie with the fact that the 2400 II series headsets are 40% lighter than competitors, are made of surgical steel, and also maintain reinforced Kevlar cording. The Jabra BIZ 2400 II DQ Duo NC WB is ergonomically designed as well as fitted with a super-soft ear cushion. The Jabra BIZ 1900 Duo USB is a binaural headset with a noise canceling microphone. This headset plugs in using a USB Connection, making it a good choice for VoIP Softphones or IP Telephones with a USB Connection. The Jabra BIZ™ 1900 Series delivers professional performance and exceptional value. It's the cost-effective headset investment decision that doesn't compromise on quality. Designed for contact center use, the Jabra BIZ 1900 Series increases agent productivity and performance. Its noise canceling microphone ensures that background noise from your work environment won’t be transmitted to your customer's ears. The headset comes complete with QD (Quick Disconnect) plug for instant connectivity to a wide range of amplifiers and telephone systems or USB plug for instant softphone connectivity. Simply connect the headset to the telephone system or laptop and you’re ready to profit from the Jabra BIZ 1900's low cost of ownership. The Jabra BIZ 1900 corded headset is available in both mono and duo and its multiple adjustment points make it truly adaptable to individual preferences. Its headband wearing style combined with a lightweight design ensures all-day comfort – even in very telephone-intensive environments. Leather ear cushions are standard.